This is a picture of the residents of the Dwelling taken approx 1950 but I am not sure!! Any idea of the date of this photo? I think the lady on the top left side in the Red Cross uniform was Rosie Lewis, and her daughter was Councillor Pearl Betts. Does anyone remember this lady? Yes. That’s I’d my Auntie Rose and my Nana Blake. Auntie Rose worked at Tilbury hospital, as did my father. Irene Fowler (net Banham. My mum was the youngest sister of rose. Yes it is Rose Lewis in her Red Cross uniform, my aunt. Back row 2nd from right is Mrs Jane Blake, my Grandmother and Rose Lewis’s mother. And I do remember councilor Betts, she was my cousin. These 3 persons never lived in the dwellings. My nan used to live in the big house at the back of St John’s Church. …I remember as a child visiting her and eating ‘dripping sandwiches ‘ – Gert Whiffen. ….she worked on the fruit and veg stall at the Old Grays Market. ..
this photo was taken on a day out with the red cross as they used to run a club for older people. on far right of the photo is mrs burgess and behind her is her daughter in law marabelle and next to mrs burgess is my mum mrs tilly west and mrs gert wiffen next to her. most of these people did not live in the dwellings, my mum and mrs wiffen lived in auckland close behind st johns church. there were two big houses which were pulled down in the late sixties and replaced with a bungalow by the council. my mum used to deliver greengrocery to the dwellings on a horse and cart in the forties. If you dig around the internet there are one or two pic’s the Dwellings, if I come across them I’ll put them on here somewhere. Rod Downes did you know Tom Webb who lived in the Railway cottages – must have been 1966-67 and he’d have been 6 or 7 years old at that time? The lady 3rd bottom row on the left as you look at the photo is my grandmother Queenie Sutcliffe. I believe she was the second from last person to leave the Dwellings, but still remained in Tilbury. She worked at Tilbury Hospital until her retirement. Rod, your comments about a lack of photos of the Dwellings and Railway cottages..check on this site, as there are a definitely some on here..as soon as I sort out my filing system..there will be at least one more. The lady standing at back 3rd from right looks like my nan who never lived in the dwellings.But,she did work in Tilbury hospital which was very near if not next door and that looks like the building in the rear of the picture. Shame they never took the picture in front of the Dwellings. There does not appear to be any pictures of them anywhere. Likewise, the railways cottages where I lived as a kid. 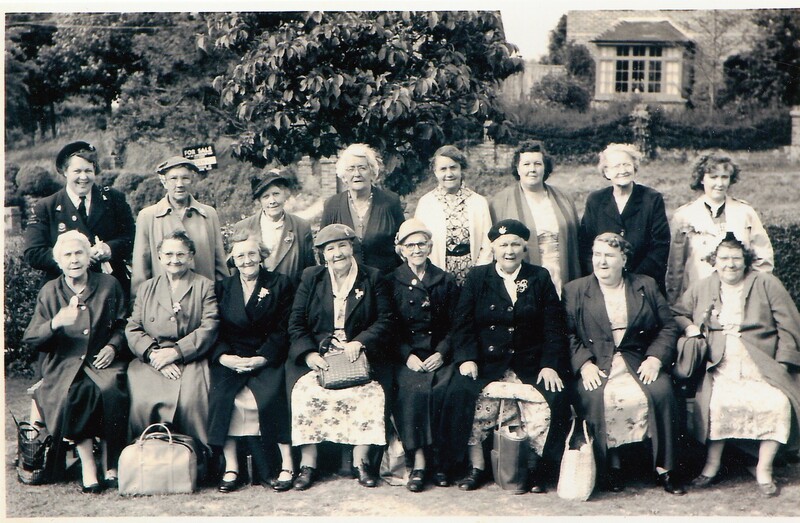 I think the lady on the bottom row third from the right is my great nanny whiffin. my mum, as then joan park, told us that my nan rose stillaway, lived in the dwellings when she was a young girl, she lived there with her brothers and sisters, and of course their mum and dad, they must have lived there, 1900s. I have a group picture including my great grandmother, Annie Salmon which is taken in front of the exact same bush!